Actual departure times may vary; multiple launches within the hour are possible. Romans point is a hidden gem located in Herbster, Wi. You won't hear about this location from the NPS as it is just outside the park boundary. However, touring Roman's point won as our top pick for 2018 over our past years' top picks for touring the Myers Beach Caves in part due to overcrowding and congestion in the Meyers Beach Cave areas where wait times in lines up to 30 minutes to get into the caves is common along with boat fumes from other touring companies. For an intimate experience with the sumptuous sandstone of the Apostle Islands we suggest signing up for Romans Point. Roman's point also boasts free parking, is night-paddle and paddleboard friendly, and if your with your with your dog, as long as they're comfortable on a kayak (has been on one before) they can have their own seat and come along*! This tour starts in an estuary, where amazing wildlife and plant life is abound & features loons, herons, pitcher plants and wild rose bush islands. 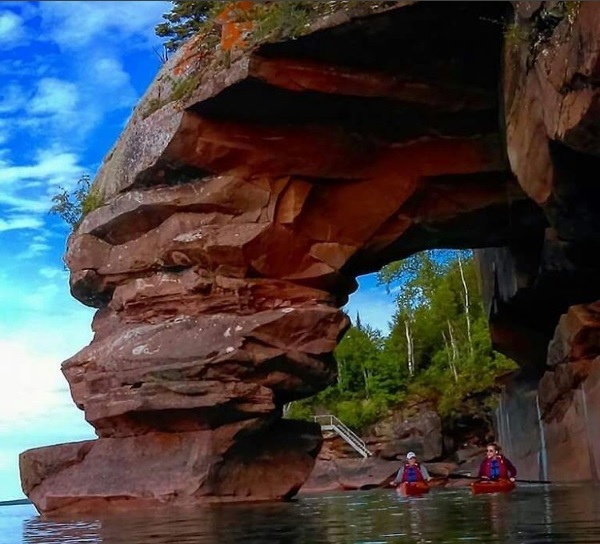 As for the caves, they vary from massive to intricate and you'll get to see the most photogenic sea arch in the Apostle Islands. places to paddle because private property owners have ladders leading down to the water to allow for safe extraction if necessary. Trust us, you want to go to Romans. On this tour we allow you to enjoy yourself inside each cave for as long as you like and give you every opportunity to stop for photos that you will remember for a lifetime. **Dog ride along fee is priced as a child's ticket. To add your dog to your tour, please select the cost of a child ticket and note that during checkout. Dogs must be comfortable in this kind of environment and have been on a kayak or canoe before.